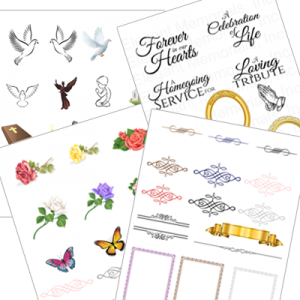 Funeral stationery is a very important part of any funeral and memorial service. There is almost always some kind of program, booklet or handed out a funeral or memorial service. These handouts are used to help inform guests of information associated with the service and also help family and friends follow along with the service. Many people will keep the programs or keepsakes as a momento of the person being honored. A Funeral Stationery Template is often used when users want a DIY funeral program or printed memorial. Funeral stationery can be called many different things. Often time the differences are very slight. This quick guide will explain the various funeral stationery products that you could use during your funeral or memorial service. Here are a few examples of printed funeral stationery items. Funeral Program -- The funeral program is the standard printed document that's handed out at funeral and memorial services. The funeral program typically contains an funeral order of service, an obituary, as well as photos, poems, scriptures and even photo collages. Funeral programs can come in many different sizes and layouts and are also available in a wide variety of styles, colors and themes. Funeral Booklet -- Similar to a funeral program, but may contain more pages. Funeral booklets can have 4, 8, 12 or more pages. Typically, a funeral booklet folds right down the middle. 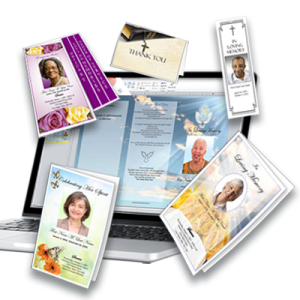 Funeral booklets often have many different types of information including funeral tributes, eulogy, poems and many photos. 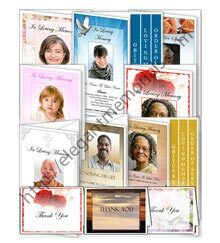 Funeral Pamphlets -- Funeral Pamphlets are like funeral programs or booklet, except they may have a trifold or z fold layout. Trifold programs are good for adding additional pictures and photos. You can get trifold funeral pamphlets in a variety of sizes including standard 8 1/2" x 11", legal 8 1/2" x 14" or even tabloid 11"x 17" size for a large pamphlets. Funeral Pamphlets usually consist on one page, printed on both front and back. Obituary Template -- An obituary template is a funeral or memorial program, usually with multiple pages. It typically features a full lenghth obituary as well as poems scriptures, and many photos and photo collages. Obituary templates usually feature unique designs, such as graduated fold, 4 page graduated fold, tabloid, gatefold and graduated bottom fold. 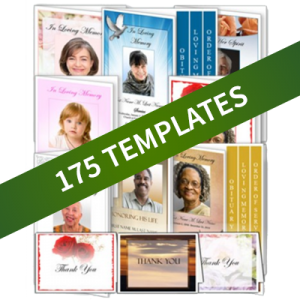 Funeral Brochure -- A funeral brochure is very similar to a program or booklet. It can come in a variety of paper sizes and paper folds. Common folds are bifold or single fold and trifold or Z-fold. Pick a fold based on the time you have available and what you plan to include in your brochure.